The Illawarra area boasts dramatic beach and mountain scenery. 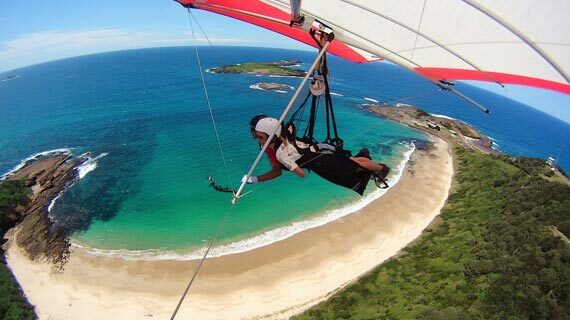 Hang gliding in Stanwell Park and Hill 60 showcases our spectacular beaches, Grand Pacific Drive and the Illawarra Escarpment. We are the only hang gliding school to fly from both hang gliding sites, which means we are can hang glide on more days of the year. 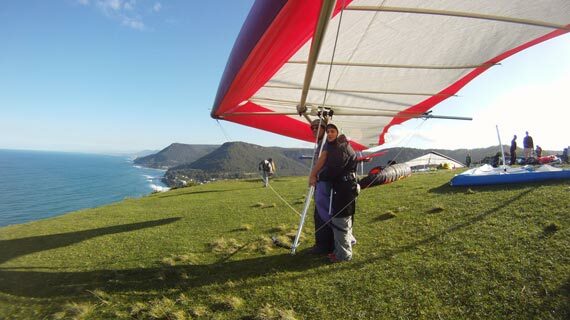 Bald Hill, Stanwell Park is the primary hang gliding site used and boasts amazing views of Grand Pacific Drive. Undoubtedly one of the premier coastal flying sites in the world, located just 1 hour south of Sydney. We are able to utilise this site when the winds are from the south/southeast. The site is about 500 feet high above the sea level, providing spectacular views of Grand Pacific Drive, the Royal National Park and the coastal escarpment. From Sydney, take the Southern Freeway (F6) past Waterfall and keep travelling south until you reach the exit (left) for Stanwell Park. When you reach the roundabout, drive straight through, and stay on Lawrence Hargrave Drive until you the STOP sign. This point is the intersection of Lawrence Hargrave Drive and Lady Wakehurst Drive. Go straight through, travelling on Lade Wakehurst Drive for about 200 metres and turn into the Bald Hill car park. Hill 60 is a great flying site when the summer north easterly winds are blowing! Located just 25 minutes south of Stanwell Park, Hill 60 Wollongong boasts crystal clear waters, overlooking beautiful swimming beaches, the five islands of Wollongong and Big island, a bird sactuary just offshore. So you'll be sharing the air with sea birds, large and small, and the north easterly winds make for warm sunny weather. Great hang gliding conditions, and we're the only school flying here. From Sydney, take the Southern Freeway (F6) past Waterfall and keep travelling south towards Wollongong. At the bottom of the descent (Mount Ousley), continue past the Wollongong exit on your left, and stay on the highway, as it bears to the right. Remember, do not take the Wollongong exit (left). Travel on the freeway until you reach the Five Islands Road Exit on your left (Exit No.155) for Port Kembla. At the traffic lights (50 metres), turn left onto Five Islands Road and continue on this road until you pass the steelworks. As soon as you pass Blue Scope Steel signage, that is at eye level and on your left hand side, take the immediate exit to your left (Exit.155). Five Islands Road then changes into Military Road. Stay on Military Road until you start an ascent towards Hill 60. At the end of the ascent, turn left and that will bring you to Hill 60.